We show an algorithm that learns decision lists via equivalence queries, provided that a set G including all terms of the target list is given. The algorithm runs in time polynomial in the cardinality of G. From this last learning algorithm, we prove that log n-decision lists - the class of decision lists such that all their terms have low Kolmogorov complexity - are simple pac-learnable. Castro, J. 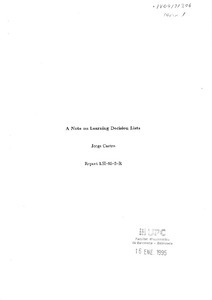 "A Note on learning decision lists". 1995.